There's been a cycle of rain, chill, warm, rain, chill, warm in this month. If I had the money, I'd get the drive redone to remove the puddles, make the drainage to the street better. I buy bags of gravel and spread it around but, over time, the gravel disappears and the puddles come back. But if I got rid of the puddles, I'd deprive myself of this. 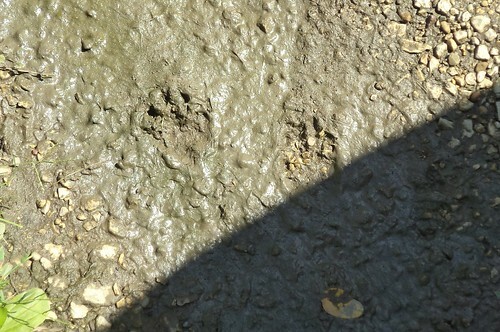 Raccoon tracks. Annoying buggers, they are. They come up onto the deck and mess up the birdbath. I'll have the feeling someone is watching me, turn to look out the office window and see a pair of beady black eyes looking in at me. About this time of year, I get the single males or females nosing about. During the summer, it's usually the juveniles traveling in duos or packs. The new garbage can has thwarted their attempts at dumpster diving, thankfully. I've had only one incident all summer of the garbage being strewn about. Footprints remind me that we share our lives with all manner of animal. I never saw raccoons on the farm as I have seen them in suburbia. Skunks? Oh yeah, but not raccoons or opossums. Maybe they were too skittish, too wild, to be a part of farm life. In the urban environment, they have to be bold to survive. We enable them with our smorgasbord of foodstuffs just waiting to be picked and then we complain when they leave wrappers in the birdbath. I think about getting another bag of stones and filling in this puddle before winter comes. Meh, maybe not. I think I'll wait until spring of next year.